In need of a tall mug to help your brand get out to new clients and customers? When people talk about “big mugs” they often mean mugs with a capacity of 350ml, maybe 400ml. Our Tower Photo Mug truly is a big mug. With a capacity of 480ml and a large print area, the Tower Photo Mug is a great promotional mug. Promotional mugs are a great way to get your message or brand across – who doesn’t have a coffee mug in their home or office kitchen? Why not make it be your promotional mug they reach for instead of some bland department store mug? 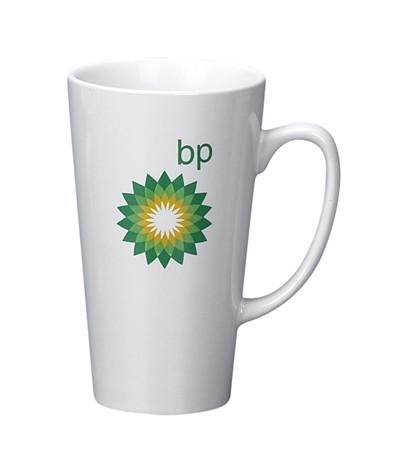 Our promotional Tower Photo Mug is a sound choice for any of your customers or clients, new and old; it can easily travel from the boardroom to the work site, blend in with any office setting while still standing out, and is especially good for events where you might need to print the brand names of event sponsors. These branded mugs are also a great choice if you need a giveaway option for your customers or event attendees. Due to their size, they aren’t just great for a simple mug; they can also be filled with other goodies such as lollies, chocolates and stationery which gives you even more branding opportunities. The Tower Photo Mug is a well-made and quality mug; boasting benefits such as its large size, large logo print area, multi-use function and tapered look, your customers and clients will love having one of these turn up at their office or work site.